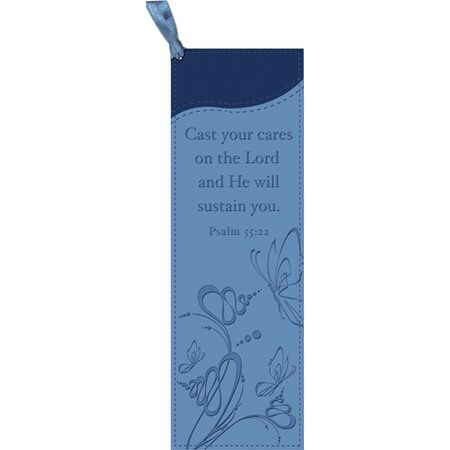 Luxurious bookmarks with debossed graphics and sentiment, 2" x 6.5" with ribbon corner loop; packaged in attractive PVC pouch; an appreciated gift for readers and Bible scholars. Give one with every book and gift Bible! Butterfly swirl motif in blue; Psalm 55:22 Cast your cares on the Lord and He will sustain you. Luxleather faux leather bookmark.